Parts of this world-famous inn date back to the sixteenth century, and it still bears all the hallmarks of a dyed-in-the-wool Irish hostelry - right down to the old stone walls, blazing turf fires, gaslights, Guinness and music. There are no gimmicks, just fine hospitality and a good craic. 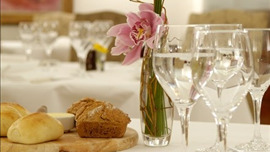 Food is served in the bar and in the candlelit first-floor restaurant. Seafood from the local boats is one of the stars, and the kitchen produces anything from bowls of mussels in white wine, parsley and cream to baked fillet of cod with tomato and basil sauce. Other possibilities could include silverside of corned beef with cabbage, crispy roast duckling with ginger and pineapple sauce, plus homespun desserts such as apple pie. The Abbey is noted for its live entertainment, which is staged every night in the adjacent Barn: a five-course dinner is part of the package and you need to book well in advance. 90% Lean Irish Beef Pattie, Vintage Cheddar Cheese, Crispy Bacon, Pickles, Beef Tomato, Onion, Lettuce on Toasted Brioche Bun. Accompanied by French Fried Potatoes and a side of Coleslaw. Butterflied Breast of Irish Chicken with Cajun Spices, Crispy Bacon, Beef Tomato, Lettuce and Mayonnaise on Toasted Brioche Bun. Accompanied by French Fried Potatoes and side of Coleslaw. Vegetarian Dish Comprised of Ricotta, Mozzarella, Cheddar & Cashel Blue Cheese Stuffed Pasta Parcels in Basil & Spinach Cream Sauce.